The term “city-riding” always had me thinking of sitting in traffic, getting clipped by cabbies, racing light to light with streetcars, and getting really hot and sweaty. Well, this is only seldom the case. I’m going to show you how to have a blast riding in the city with your friends. 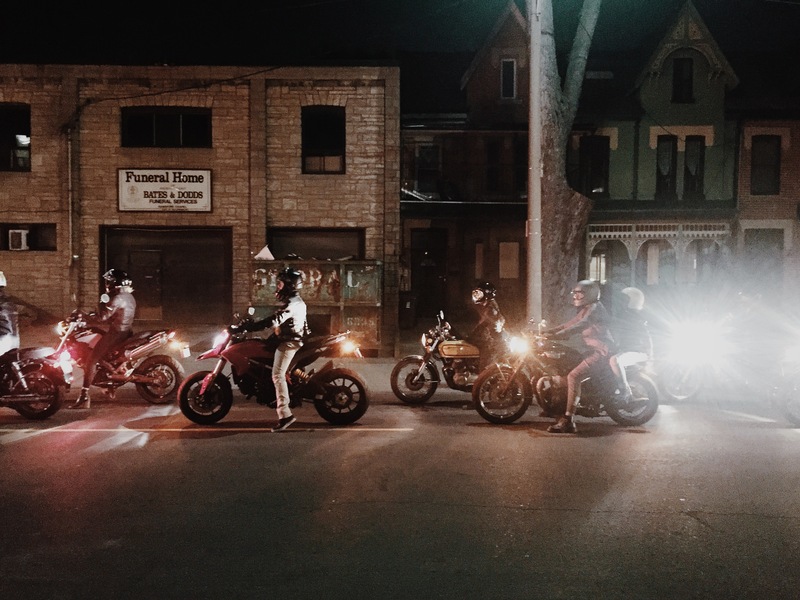 In late July, my pals from Town Moto and I hosted the #HiloProject crew from Chicago during their stay in Toronto. 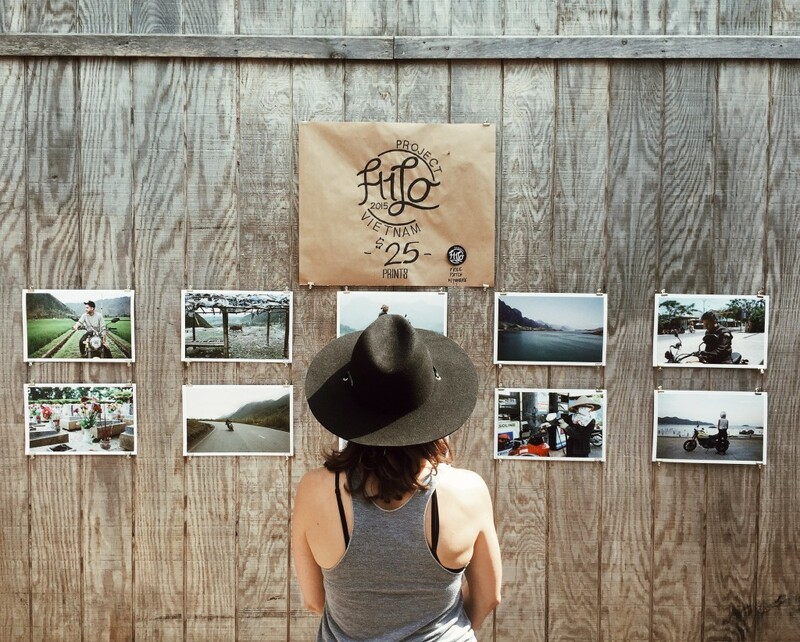 The #HiloProject crew rode into town to co-host our summer Town Moto Ride-In and to share photos from their recent month-long motorcycle trip through Vietnam. 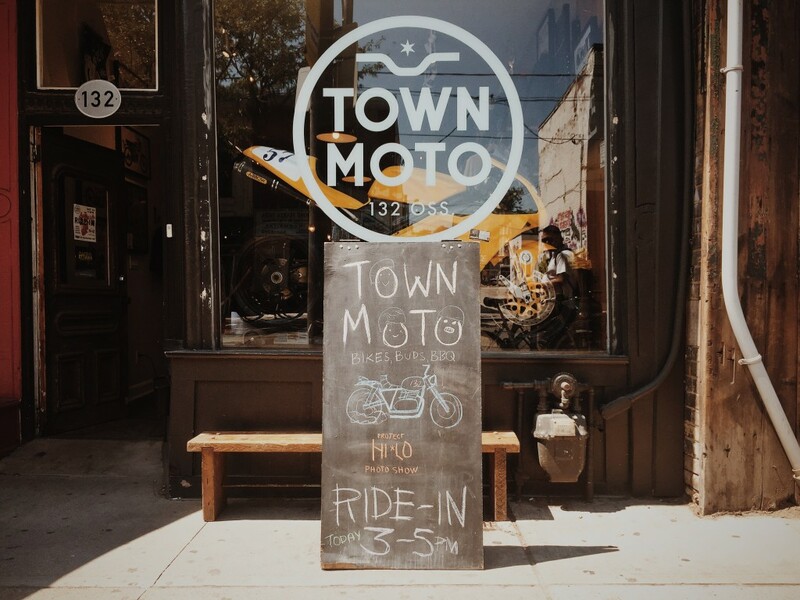 You can check out the event photos on the Town Moto blog. 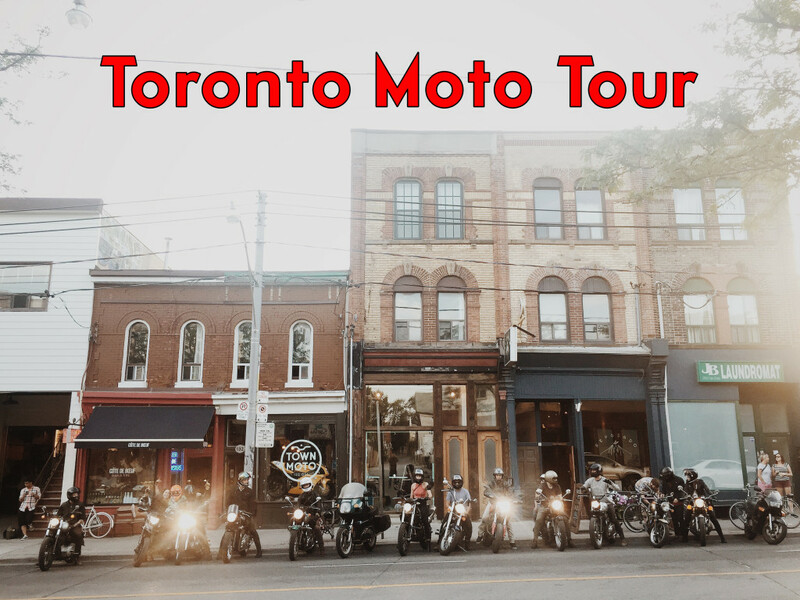 After the Town Moto Ride-In, I planned a short evening “Toronto-Moto-Tour”. A fun evening ride in and around the city to give our new friends from Chicago a taste of what Toronto city-riding has to offer. I realized while mapping out the route and thinking about all of the details, that my process and preparation may be of interest to our motorcycle community in the city. Here is a fun route if you’re looking for a quick evening rip through the city and a bit of my process to help you plan your own. Riding outside of peak city traffic hours is key to having a pleasant and successful ride. I recommend riding after 7PM in the evenings or before 7AM in the mornings. This will cut down the majority of traffic that you would normally run into during the day and give your ride much more flow. No one likes stop-and-go traffic or racing light to light on an over heating bike so do yourselves a favour and avoid wrangling your crew through the city from 8AM-6PM. 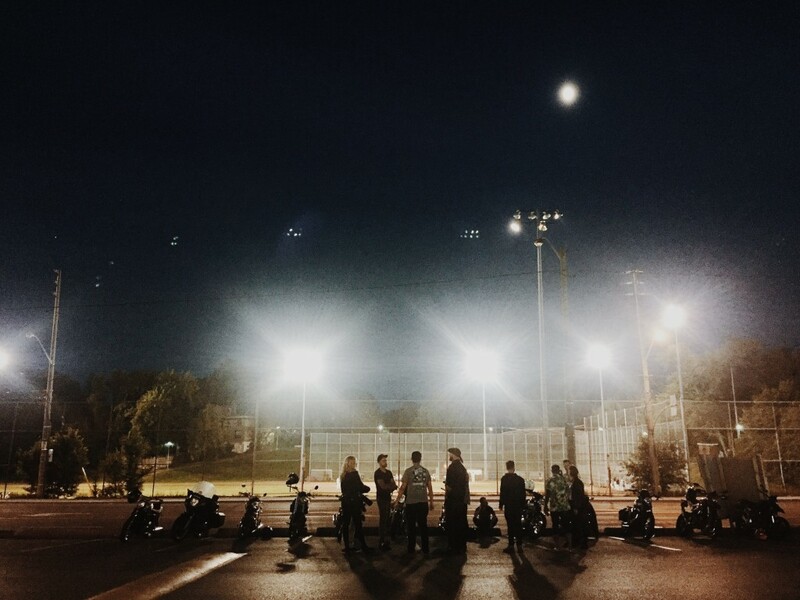 We started our ride at Town Moto shortly after the Ride-In wrapped up. The #HiloProject crew grabbed a quick bite to eat, then we all gassed up and hit the road around 8PM. We headed West to check out High Park briefly. I chose to start the ride and cross the city on Lakeshore Blvd. 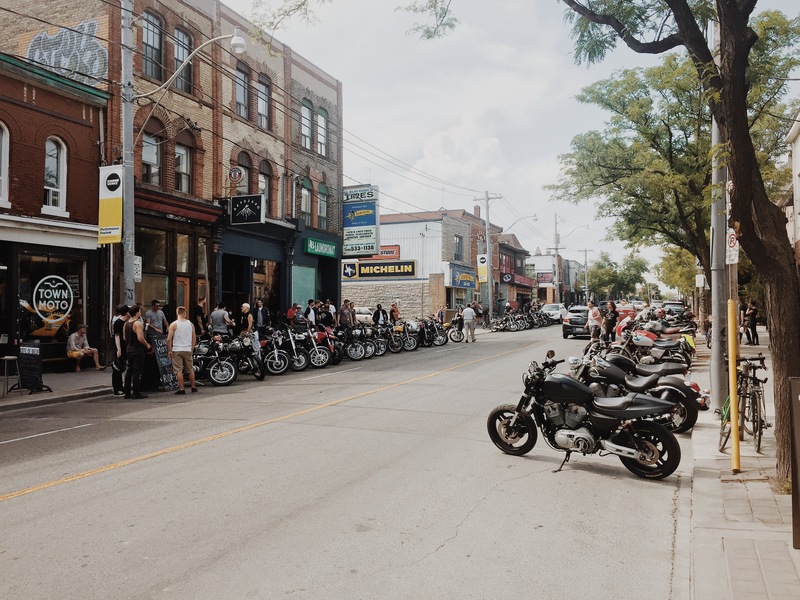 The 3 lane road is a bit faster paced, than Queen Street West and the fresh breeze blowing in from the lake, combined with the quicker pace gets everyone a bit more stoked right off the bat. It’s always good to start a ride with a bit of momentum and fun. After we rode through High Park, we headed East to Casa Loma at Davenport and Spadina. Riding South on Spadina from St. Clair is quite scenic and will give you a nice little curve around the castle to tackle. One thing to keep in mind when leading a group through the city is to pay attention to lights – specifically the countdown walking lights to help you stop early enough before splitting up your crew. It also helps to have a rider with a distinct or bright helmet always ride in the last position to help the lead determine that everyone is together. It’s always more fun when the crew is together (especially when most of them aren’t familiar with the route). If you get separated by a light, those who made it through can pull off to the side where it’s safe and wait for the rest. No biggie, but a bit of attention and planning ahead with some extra awareness of what’s going on behind and around you will help keep you all cruising together. From High Park, we rode across Howard Park and hit the slightly industrial Sterling Ave. for a few short twistys. Then we made our way up to St. Clair via Dufferin, Geary Ave. along to Christie and down to the castle via Spadina. From Casa Loma we headed further East to ride Rosedale Valley Road down to the Bayview Ave. Eastbound, Rosedale Valley Road starts just East off of Yonge Street as Aylmer Ave. It’s a scenic single lane road with 1 stop sign and it gently winds through Rosedale Ravine Lands and meets the Don River at Bayview Ave. This is a short but definitely sweet part of the total ride. After Rosedale Valley Road, we headed North on Bayview Ave. to Eglinton Ave. E. The Bayview Ave. stretch on this route came at a good time because I started to feel a bit cramped rolling through the city for so long. Bayview is faster paced with a 60km/h speed limit and has more flow with only a few traffic lights Northbound until Eglinton Ave. The landscape is also quite a bit more open in the valley creating a really cool atmosphere to ride in. You will be thrown some sweeping turns and will cross under some big bridges that allow traffic to flow over the valley. Riding Bayview Ave. is always a blast. The point of cruising North on Bayview Ave. was simply to experience the road and to get far enough North of the valley to have a nice cruise back South into the city on the Don Valley Parkway (DVP). We jumped onto the Southbound DVP at Eglinton Ave. and had a nice, cool ride back into the city. The DVP is similar to Bayview Ave. but quite a bit quicker with a 90km/h speed limit, quite a bit higher up on the exhilaration meter and also physically higher up in the valley, making for a pretty cool view coming into the city. Riding South on the DVP is probably my favourite road in Toronto. Riding it during a golden sunset makes it even better and will instantly make you fall in love with Toronto. Please note, the Don Valley Parkway is also often referred to as the Don Valley Parking-Lot which it literally turns into during peak city daytime hours. So avoid riding the DVP during peak times because it’s no fun and you wont understand why I love it so much. 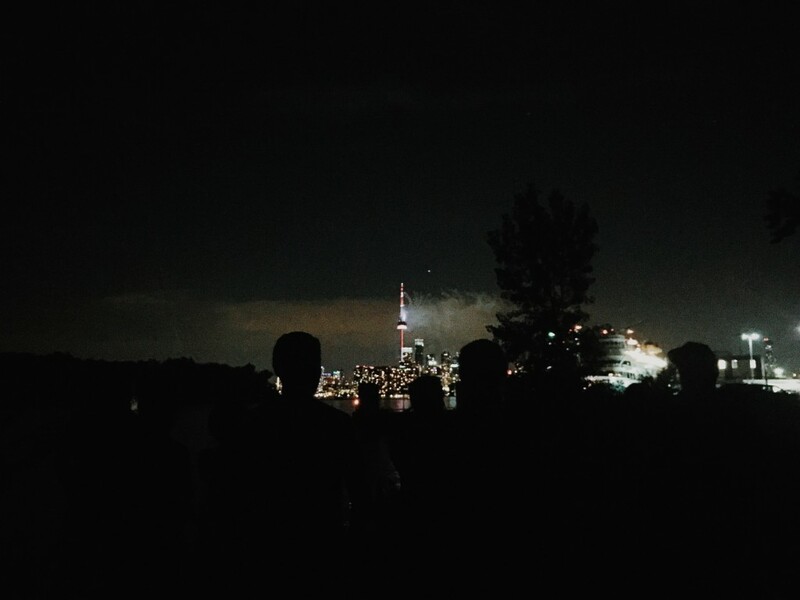 After our DVP cruise, we took the crew to the tip of Cherry Beach to catch a nice view of the city skyline and the Pan-Am Games closing ceremony fireworks. The fireworks were a perfect co-incidence but we were all happy it lined up that way. Toronto looked real hot that night. Cherry Beach is a fairly quiet beach at the south end of Cherry Street. It’s underrated likely because it’s behind all the shipping yards and an industrial part of town but it makes for a fun moto getaway. 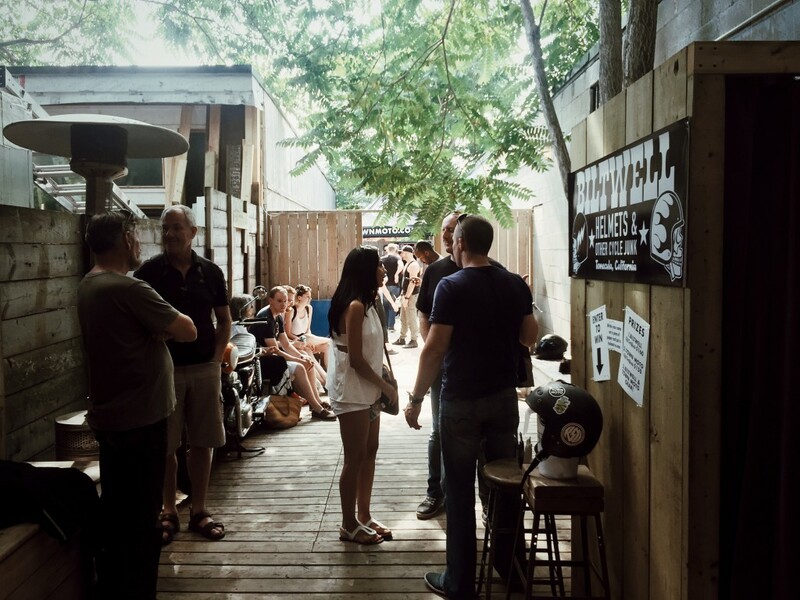 After the fireworks, the crew needed to be fed so we headed to Dog & Bear on Queen West to hang out, wind down and grab a bite. We rode around from Cherry beach to Leslie Street along the lake via Unwin Ave. 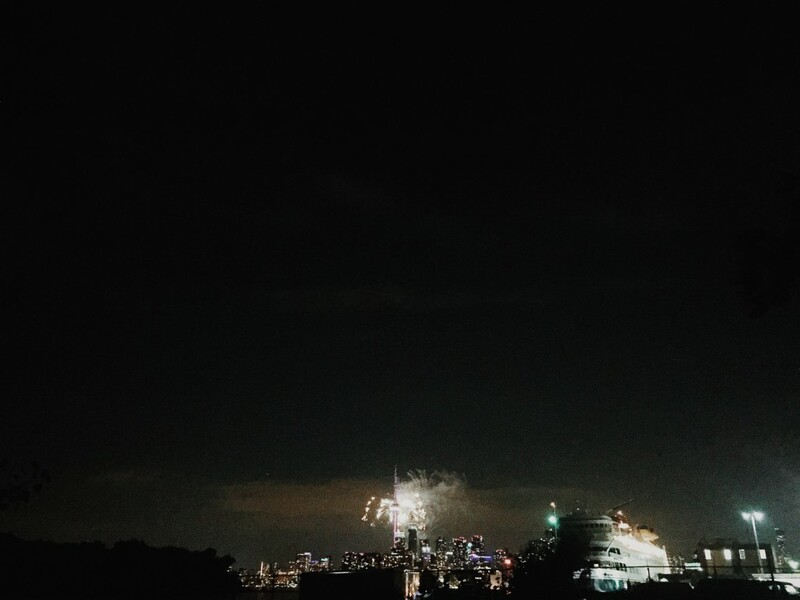 It was dark and a bit chilly, but well worth the slight detour to catch the epic view of Toronto coming Westbound. The detour East on Unwin Ave. allowed us to jump on Lakeshore Ave. Westbound from Leslie Street and jump onto the Gardiner Expressway Westbound at it’s farthest Eastern point. The view into the city from once you get onto the Gardiner Expressway up until you get to Spadina Ave. is the greatest view of Toronto available. Day or night it’s beautiful but my favourite is either during sunset or when the sun has fully set. Go Ride it! Putting rides together and planning routes is fairly simple, but there are a couple important things to remember. Flow is key. By “Flow” I mean momentum, or forward motion. Too much stop and go is tiring, and eventually gets annoying. Select roads that allow for good flow and that keep the ride moving. Select roads that have some twists and turns and that have a nice atmosphere. I use Google “My Maps” to create my routes. “My Maps” is different from the regular Google Maps and will allow you to plot points and specific routes where Google Maps gives you the most direct routes to choose from with limited customizing ability. “My Maps” also lets you export your maps to a KML file that should work with your GPS. Pretty sweet. Regular Google Maps is great at giving accurate directions and putting together a basic route map. It limits how many specific route alterations you can make so you’re better off creating a google account and using “My Maps” to do it all. “My Maps” also allows you to save your maps and edit them at a later date. We all know that city riding is not as epic as getting out into the Muskoka twisty’s. 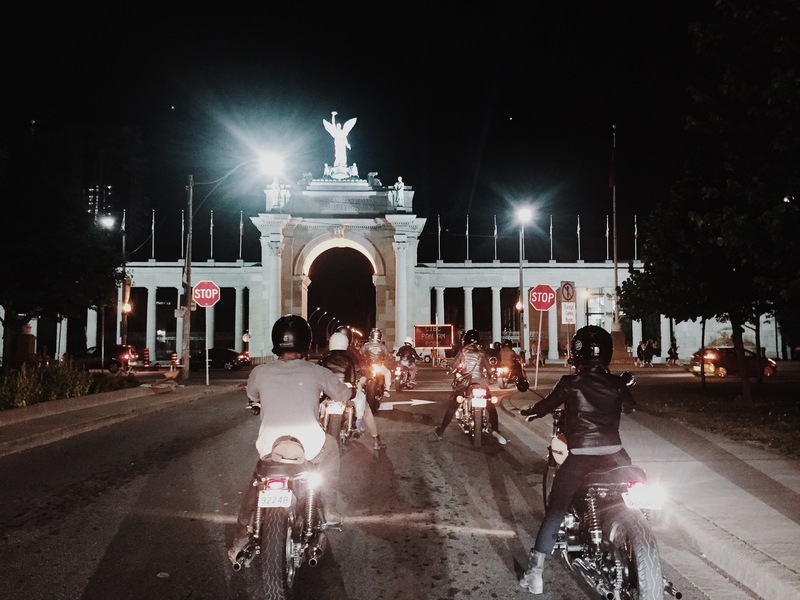 But, if you’re looking for a fun way to spend an hour with your bike and your buddies, then you’ve got some great riding options in Toronto. I hope this route inspires you to get out there a bit and create some of your own routes. Be safe and have fun!